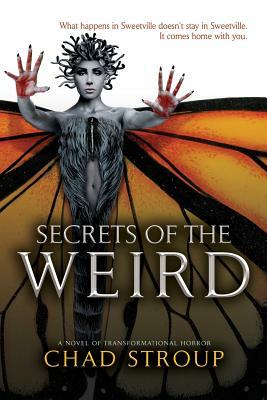 If Clive Barker and William S. Burroughs spawned a love child, you’d discover her secret self in SECRETS OF THE WEIRD. We meet Trixie, a transgender woman on the streets of Sweetville, desperate to earn enough cash to finish her transition. The city Trixie haunts is a nightmare Pleasure Island, roamed by punks, prostitutes, and neo-Nazis, frosted with a heavy dose of the drug, Sweet Candy. A hive-mind of gaunt mutants, nicknamed Withering Wyldes, whose sexless husks emerge from chemical cocoons, take obsession with body image to morbid extremes. The Angelghoul leads a cannibal cult to “Consumption Enlightement,”holding up a black mirror to mindless consumerism. Identical twin narcissists with an investment empire, turn their appetites on each other like a self-consuming snake. In this funhouse of mirrors, Trixie finds true love, falling for a straight-edge punk who wants to save the world. She hides the flesh she loathes from him, fearing rejection. When a dwarf surgeon offers Trixie her final solution, she’ll have to decide if the knife is her friend or foe. Stroup’s writing is beautiful; his visons dangerous. “Reassign, realign, redefine.” --R.J. Crowther Jr. The fulfillment of your every desire... That's the enticing yet dangerous promise of Sweet Candy, the new designer drug making the rounds through the community of club kids, neo-Nazis, drag queens, prostitutes and punks who populate the mean streets of Sweetville. With its chewable hearts and candied lips threatening to forever transform the delicate social balance and the very lives of each and every member of the city's underground, Sweet Candy is poised to ignite the tenuous powder keg that is life, love and lust in Sweetville. But could the enigmatic back-alley surgeon Julius Kast and his partnership with a peculiar cult be the spark that lights the fuse once and for all? And how will their actions affect the life of a young woman named Trixie who is seeking salvation through transformation? Take a remarkable journey that's equal parts irreverent social commentary, revisionist dystopia, dark fantasy and horrifying reality when you travel to the unforgettable world of Sweetville's counterculture where a host of sometimes dangerous, often deviant and always dark secrets are waiting to be revealed. Such secrets refuse to be confined to Sweetville. But instead come home to you. Chad Stroup’s dark short stories and poetry have been featured in various publications. Secrets of the Weird is his first novel. Stroup received his MFA in Fiction from San Diego State University. He is a member of the Horror Writers Association and the San Diego Horror Professionals, and he dearly misses playing music.